With little or no support from authorities, mountain farmers of Nepal have been using traditional knowledge to come up with temporary home-grown solutions while combating climate change problems. While some of their ideas have worked, others have not been adequate to protect their crops from unpredictable changes in weather. Some farmers have had to abandon staple crops as a result, and make harsh decisions like turning to agriculture that is easier to cultivate. Nepal: Chandramaya Humagi is busy with splashing muddy-looking water on her two-week old onion bed. 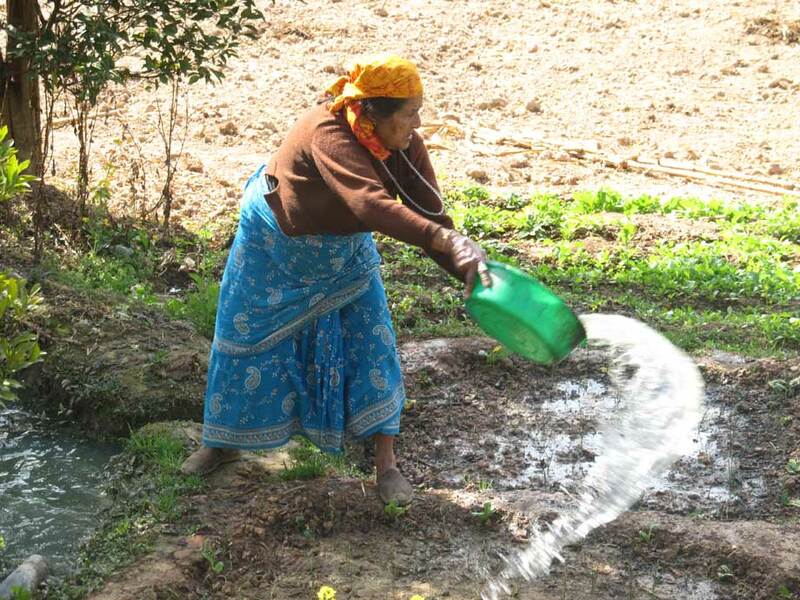 She is 72 years old, and says that the family had had to adopt this technique of wetting their vegetable garden due to unpredictable rainfall. In between her chores, Chandramaya tells us this - “Over the last few years, we’ve noticed that the weather is not the same,” she shares, “We find that it does not rain in the months it used to, and when it does rain, the quantity varies.” These sudden bouts of heavy showers were not only unpredictable in terms of timings, but also in the quantity of rainfall as well, prompting this septuagenarian to come up with an ingenious method to conserve water and recycle it for her vegetable fields. This farmer family had consciously decided to use household waste water because rain patterns changed, forcing them to alter their farming decisions. Rain Water Harvesting (RWH) would have been another way out and a more appropriate solution, but this family did not have any inclination about how it works. Dr Bed says that large rainwater drums have also been constructed in the region to store excess rain and this water is used for agriculture. “Just has how building up the mountain farmer’s resilience towards weather changes is very crucial, so also is the need to introduce water saving crops among them,” feels the Environment Professor, adding that better sharing of weather information and forecasting, climate change adaptation techniques and risk-reduction and management programmes for farmers will go long way in helping this community cope with shifting climate conditions and rainfall variability. Chandramaya is not the only one to be effected by changing climate in the mountains. 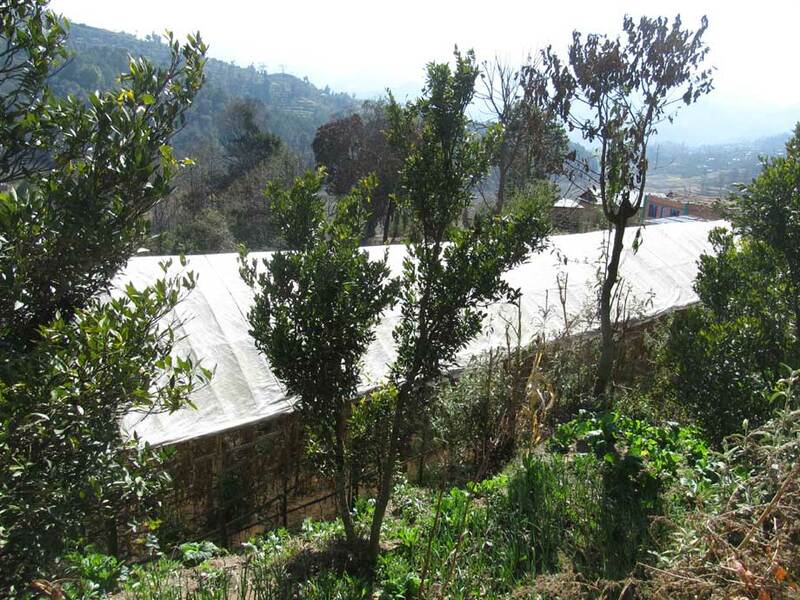 Many farmers from the tiny Panityanki village in Kavrepalanchok District, about 35 kms from Kathmandu in Nepal, have learned to adapt to changes in weather by coming up with home-grown solutions, while others have simply changed the way they cultivate. “I cannot prepare my fields for paddy without knowing what the weather is going to be like over the next few months; therefore I had to opt for a safer crop like vegetables,” he says. Bidur says his fear was that if he decides to sow paddy and if it did rain suddenly, it will flood his crop. “If the difference in weather changes were only small shifts, then it won’t matter too much for me, but there is a two-three month difference in the monsoon season! Such changes only mean heavy losses for me,” he explains. Ramji Umangi’s story is no different. “All my previous generations have been farmers on this very same land,” he declares proudly while talking of his many years in agriculture. His 60-plus-years experience has made him an expert in predicting the perfect timing a farmer needs to sow and reap a good harvest. “We’ve been having less and less rainfall every year, and so naturally we’ve begun to notice more pests,” he observes. “Farmers including myself are forced to use chemical pesticides, particularly for cauliflower and cabbage crops, to keep the pests at bay.” This is the only way, he says, he can be sure that the pests will die quickly and his crop will be saved. According to Nand Kishor Agrawal, Programme Coordinator for the research project HICAP (Himalayan Climate Change Adaptation Programme) at the International Centre for Integrated Mountain Development (ICIMOD), Nepal, “Globally, mountains are climate hotspots since rising temperatures are much higher and as expected, problems come with these changes.” He thus suggests that farmers should use natural pest predators instead of chemical-based pesticides to tackle the issue. HICAP is an initiative that is looking at identifying long term solutions in the Hindu Kush Himalayan region by linking climate science research knowledge with the experience of farmers and communities who are already facing the consequences of climate change. The former Mayor of Dhulikel Municipality, Kavre District Bel Prasad Shrestha feels that the Nepal’s farmers must continue their traditional agricultural practices. “Nepal was a country that used to produce a lot of grain and we even used to export, but today it is the other way around.” During his 16-year mayorship, despite a lot of money being spent of infrastructure development, he says that environment protection was also given priority. He is aware that the rainfall pattern is a little different and firmly believes that the traditional practice of organic farming and conventional methods of dealing with pests and changing weather will go a long way in preventing severe crop loss. Experts in the field have maintained that temperature variations are normal and that the earth’s climate systems (including air pressures, temperatures and precipitation) are not static. Speaking on the changing weather patterns on a global level, Senior Climate Change Adaptation Specialist, Valdemar Holmgren who is with the International Centre for Integrated Mountain Development (ICIMOD) based at Kathmandu, Nepal, says that weather conditions produced include variations of all kinds that happen now and again all over the world. However, mountain farmers are beginning to realise that their traditional agriculture knowledge and practises are facing challenges. Mohan Bahadur Chand is a Rainfall Variability Expert at Kathmandu University says that the “rainfall pattern is changing constantly,” but also adds that it is difficult to confirm whether rainfall in Nepal has increased or decreased. Monsoon patterns are shifting noticeably compelling farmers to abandon major cash crops and seek alternatives including new crops that consume less water and have shorter growing seasons. “This is the happening because the monsoon rains have shifted from April to mid-June and some places in the Eastern part of Nepal, the summer monsoon now carry more rain,” Mohan informs. He goes on to explain that although more than 80 % of rainfall occurs in the summer season, the number of rainy days is reducing. “There is high intensity of rainfall within fewer days and every year, the number of rainy days is reducing by at least one-to-three days every season,” confirms Mohan. Seventy-two year old Malinli Karki was working on her potato field when we met her. “We had to dig second time since we did not find water from our first tube well,” she informs. 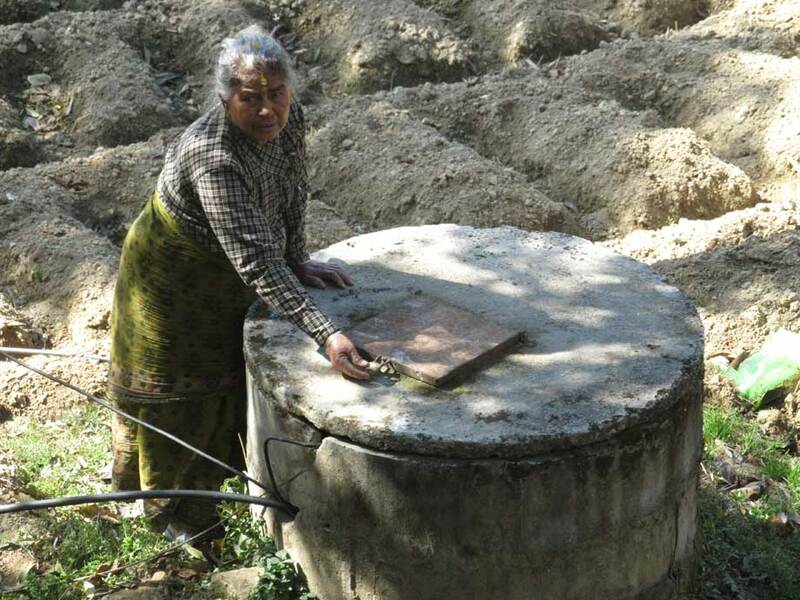 Malinli confirms that the well is 23 feet deep and is fitted with an electric motor that helps pump up water to her home. “It is all ground water and thankfully it runs dry for just three months in a year,” she smiles and adds, “We don’t waste any water. After we use it for household purposes, it is recycled for our vegetable garden eventually.” When all water dries up, the family do not cultivate anything on their lands, instead some male members of the family go out in search of wage labour as a temporary solution. Malini’s fields use to have paddy too! 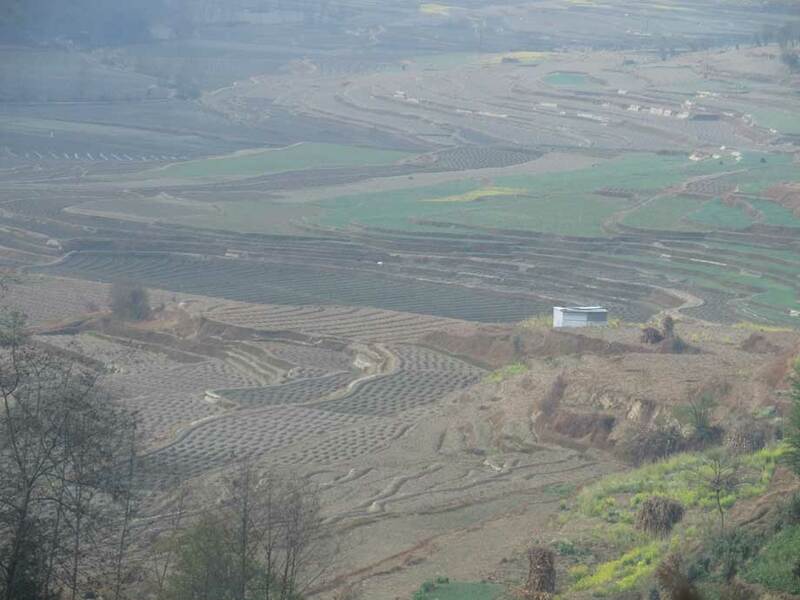 With rainfall becoming unreliable over the last five years, she decided to cultivate potato vegetable in part of her land and leave the rest they leave fallow. 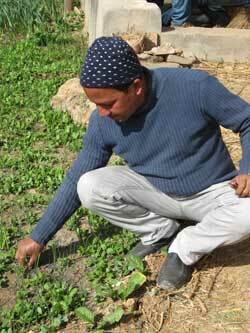 “Growing water dependent agriculture has become risky and unviable due to delayed monsoons. But for vegetable, we wait for it to rain and then start cultivating. It is less risky,” she reveals. Thanks to her well, Malini is happy that she was able to at least cultivate potato. However, Valdemar Holmgren of ICIMOD has another observation to share. As a climate change adaptation specialist, his research has been on the Koshi sub-basin and he believes that many farmers do not pay enough attention to agriculture like they used to do. “Frost is another major complaint from mountain farmers,” he shares, “but a few nights’ winter frost is normal in mid-hill areas.” Depending on the area placement i.e facing north would mean colder and south is warmer, altitude location and topography, frost will occur. Farmer Ramji hopes that someday he will be able to afford environmental-friendly solutions to deal with this frost problem. “Plastic sheets can range from anything between NR 15, 000 and 20, 000, and are too expensive for a poor farmer like me,” he laments. These cover an area of about 12 meters length and five meters in width, and have to be perched permanently. “But it is nevertheless, a shield against harsh and now-a-days, unpredictable weather conditions,” Ramji feels. Not every farmer in Panitanki is as lucky as Ganga. She owns four of these sheets and these she has used in a bid to protect her tomato harvest. She lives with her family in Panitanki village and agriculture has always been a good livelihood source. “The plastic covers are most useful for about three months in a year, from mid-November,” she explains, “and we decided to invest in it thinking that it would prevent the tomato crop from being destroyed by frost.” Her husband works as Assistant Bank Manager in a nearby district and so she is able to afford this protective measure for her crops, but sadly, despite these plastic sheets, her tomato crop has been seriously affected by frost. In Valdemar Holmgren’s view, the plastic sheets used by the mountain farmer community “in this way do not offer a real solution to protect against frost.” Valdemar recommends that to protect against frost, crops should be “closely covered with vegetation together with plastic sheets for better protection” and not simply used as an open cover. However, the occurrence of surprise frost conditions is very hard for farmers to deal with. 4. If the risk of winter cropping is taken, have a good stock of vegetation, from crop residue such as grain stalks or hay to fully cover the crop beds with in the evening when it seems the temperature would drop to zero degrees and maybe lower.